None of the swearing—all of the blood! This full-length adaptation of the hilarious off-Broadway musical is tailor-made for high-school and middle-school performers. 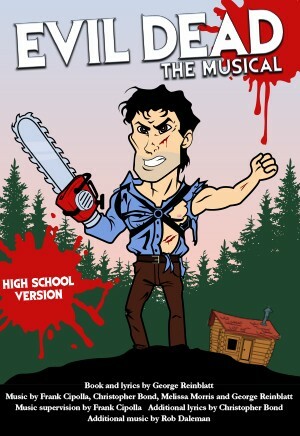 Evil Dead The Musical (High School Version) takes all the elements of the cult classic films The Evil Dead, Evil Dead 2 and Army of Darkness and combines them into one of the craziest theatrical experiences of all time. Five college students go to an abandoned cabin in the woods and accidentally unleash an evil force that turns them all into demons. It’s up to Ash (a housewares employee turned demon-killing hero) and his trusty chainsaw to save the day. Blood flies. Limbs are dismembered. Demons tell bad jokes ... and all to music. Songs like “All the Men in My Life Keep Getting Killed by Candarian Demons” and “What the Heck Was That?” will have audiences rolling in their seats and screaming for more and more blood. This show has fun with the horror genre and, in doing so, appeals to a wide audience. And with this combination of blood, jokes, cheesy effects and awesome musical numbers, Evil Dead The Musical (High School Version) is unlike any show you’ve ever seen. 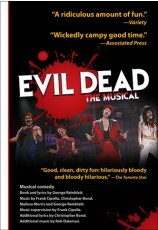 "Evil Dead the musical high school edition was a great show for our school. The audience and administration loved it. Creating the fx of the living cabin was a good challenge for my technical theater students and the play itself was as entertaining to the cast and crew as it was to our audience. It went so well we are being considered as a potential feature performing school for the Florida State Thespian Festival. If we make it through the final elimination we will be requesting royalties for two more shows in March. Our judges loved the show and the script. Thank you for letting us produce this. " Review by Ted Lewis, Buchholz Theater Department, Gainesville, Fla.
"You need a good technical crew to rig lights, sound and special fx and a creative set designer. " Tip by Ted Lewis, Buchholz Theater Department, Gainesville, Fla.